Thank you for your interest in University School. The following information and timeline will assist you with the free application process. Email Tamara Whitner or call 216.371.6807 if you have any questions. Available space in the school is limited. We recommend that interested families call as early as possible in the preceding academic year to begin the admission process. If this is your first contact with University School, please complete the online inquiry form. To begin the application process, create an online account by visiting our online application. Once you initiate the online process, you can review and update the application as many times as you wish before submitting it to us. Schedule an appointment to meet with Director of Admission Tamara Whitner and discuss your son's educational needs. Please email Tamara Whitner or call 216.371.6807 to schedule an appointment. This visit is for both boys and parents; it will include a tour along with a readiness assessment. Parents may email Tamara Whitner or call 216.371.6807 to schedule an appointment. This small group experience is a 60-minute session that allows University School Lower School faculty to observe and interact with candidates and their parents in a classroom environment. Please email Gina Wiandt at or call 216.371.6806 to reserve a time for your son. Parents should submit the form to their son’s current teacher or caregiver. The teacher will complete the form and mail it directly to University School. 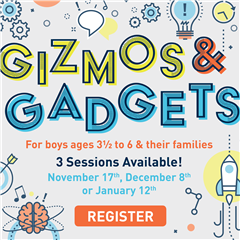 Unlock a morning of creative play and explore the world of gizmos & gadgets. The only limit is your imagination! All applications completed after initial acceptances will be considered as they are received. Please remember that while space is limited during this period, our Admission Team will continue to work with you throughout the process.